We have every reason to believe that there are many of HMB and IMCF fighters who have come into medieval full contact combat from the Reenacting. The variety of armor suitable for this sport is big but not huge. Full plate armor of Emperor Maximilian I (1459-1519). Armor has mirror finishing and decorated with copper. Nuremberg, Germany, circa 1475. It’s definitely rare to see HMB fighter in Gothic armor. There is ample evidence that the reasons are: expensiveness, the requirements of highest skills of blacksmithing, not suitable for buhurt, commonly 1vs1 tournament usability. Small wonder that Gothic armor stays for many of us just as an icon and masterpiece of medieval armor craftsmanship. Approx. by 1470 year the plate armor with Sallet helmet became an example of elegance and proportions. Not earlier before neither after, the demand of beauty and nicety of craftsmanship was so required. This period can be treated as the highest point of the medieval plate armor evolution. Later armors are also beautiful, but mostly because of their’s decorations. Nowadays we call this type of armor “Gothic armor”, German: Gotischer Plattenpanzer. The title is proved by exact elements of Gothic armor which are made completely in Gothic style. 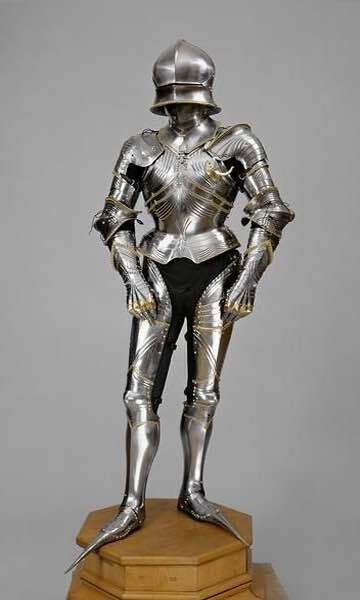 However so far as we know the main shape of Gothic armor was borrowed from Italian costume, mostly Florentian, which was so popular among noble aristocrats of Europe in the mid. of XV century. There’s a couple beautiful full plate Gothic armor examples we are finding really adorable. They were made by the hand of one of the best smiths of that time – Lorenz Helmschmid.